Mothers Day tags are so useful for tying onto your gifts for moms. They can be exquisite or they can also sport a grunge look. Since they are handmade by you yourself, you know what kind of gift you are giving and what style mama favours. So let's make these little beauties and attach them to your Happy Mother's Day presents. 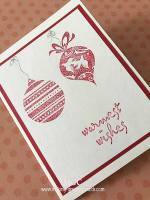 The above is made using a scalloped tag die cut on the Accucut Grandemark machine. It's a favorite of mine and I tend to reach out for this die most of the time so you might see a few of my handmade creations here and elsewhere using this die template. Die cut the pink and white cardstocks with the scalloped tag die on the Grandemark machine. Punch the bottom of white tag with martha stewart's border punch. Ink daisy reverse pattern stamp with pink petunia color ink and stamp image to cover white tag. Glue stamped white tag over pink tag. Die cut spellbinder's round frame die with pink cardstock. 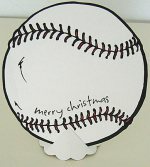 Punch 2" circle with white cardstock. Ink Happy Mother's Day greeting with smokey gray ink and stamp on circle card. 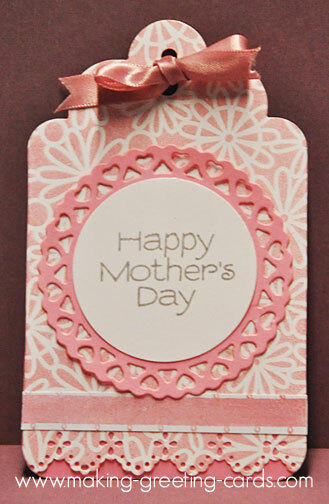 Use double-sided tape or glue to attach white circle card to pink round frame and then onto the front of tag. Ink loop ribbon stamp with pink petunia color ink and stamp on white cardstock. Trim and attach to bottom of ring of hearts frame and above lace border. Punch another hole on the scalloped tag above the existing hole. Tie a bow with the pink satin ribbon. Another tag using the same scalloped tag die from Accucut. This is a simple fresh and clean looking Mothers Day tag. The inks used are both from Memento. The colors are cantaloupe and bamboo leaves. 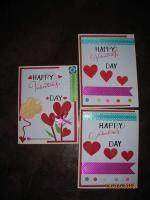 Stamps are both from Hero Arts; exotic bloom, envelope pattern and Happy Mother's Day. 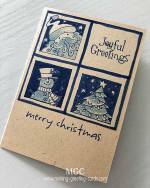 After die cutting the scalloped tag on white cardstock, I stamped the envelope pattern background image onto the white tag with Memento's bamboo leaves color ink. 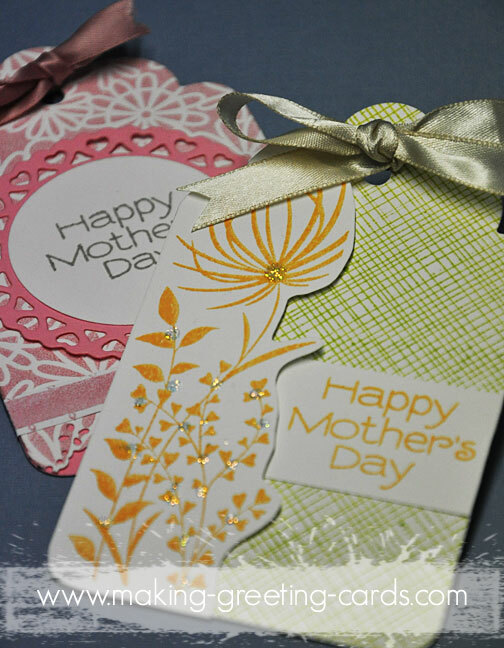 Then stamp the exotic bloom image as well as the Happy Mother's Day message with Memento's cantaloupe color ink on another piece of white cardstock. Trim the exotic bloom image on the right to the top leaving the left side to align with the white tag. Place the exotic bloom image onto the tag and trim using the tag as a guide. Use double-sided foam tape on the back of the exotic bloom image and attach to the tag aligning to the left edge. 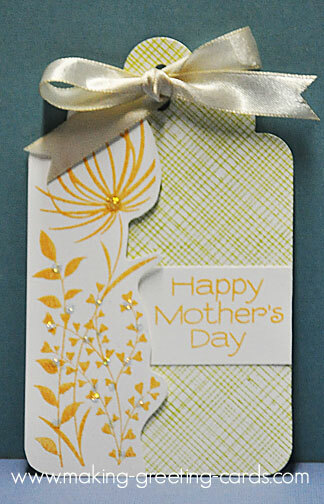 Cut the Happy Mother's Day greeting and glue onto the middle of the tag with the left edge inserted under the exotic bloom image. Punch another hole above existing one and tie a off white satin ribbon. Finally, apply some glitter glue to the flowers on the exotic bloom image. Hope you enjoy looking at these two Happy Mothers Day tags. I pray that you'll be inspired to make your very own and surprise your mom this Happy Mother's Day. how to reach and touch. when her child needs freedom most. her child will ever go.